What the fxxk is going on? Dalian? 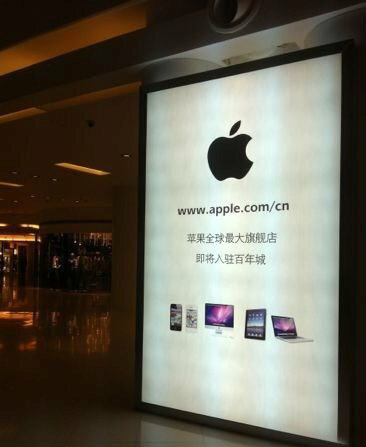 Well apparently, Apple has started putting posters of its upcoming China flagship store in a shopping center called Parkland Mall at Dalian, a rich Chinese city with a lot of investment coming from Korea and Japan. 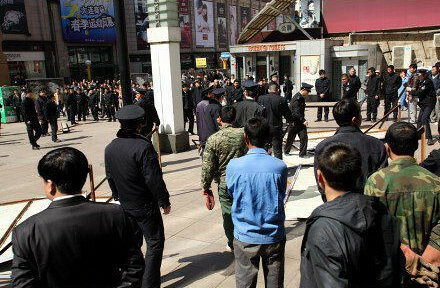 However, due to competition in shopping centres, another shopping center called Dalian Department Store is jealous of Parkland Mall for having an Apple Store. 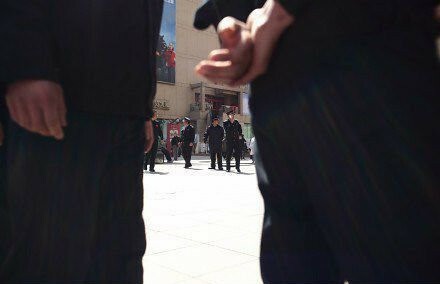 So, the Dalian Department Store sent its security team to push down the Apple Store posters outside the Parkland Mall. For more details, check out the photos and videos after the break. 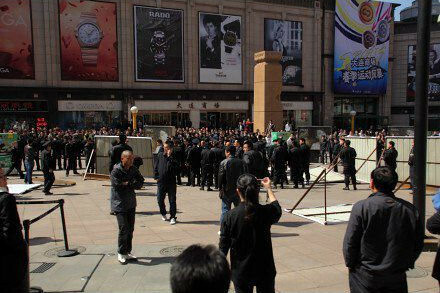 UPDATE: According to local journalists, some Apple retail managers have arrived Dalian to solve the matter. 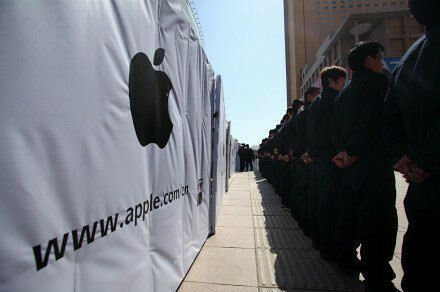 And Apple is looking forward to build the store successfully in accordance with the terms and conditions of the contract. Meanwhile, both security teams are negotiating. 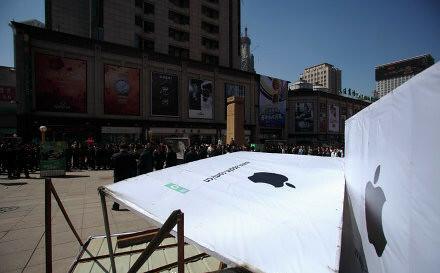 According to passersby, the posters showing an Apple logo with web address ‘www.apple.com/cn’ were put up yesterday noon, and security guards were seen standing next to the posters. 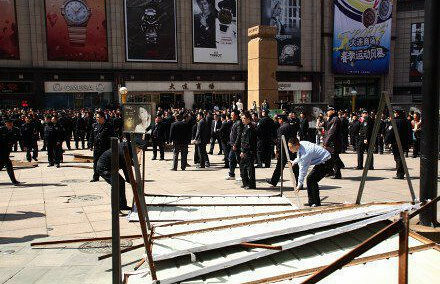 Security team from the Dalian Department Store showed up in less than 5 minutes, and pushed down the line of posters. 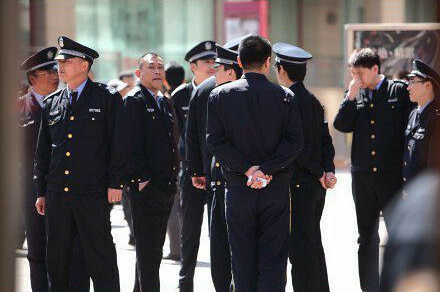 More than 10 security guards are hired by Apple to protect the posters. 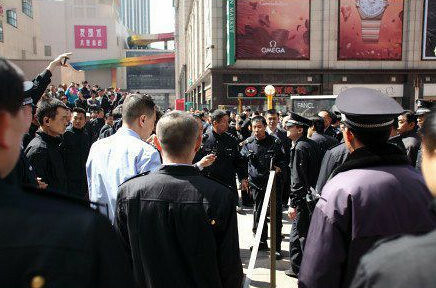 The security team is given orders to push down the posters. Both parties seemed to be negotiating. No more talks, the line of posters must be pushed down! No one could stop them. All posters with stands are ruined. 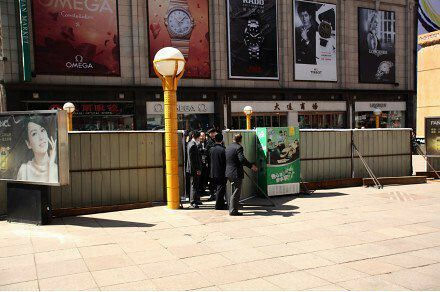 The security team warned the guards not to put up the posters again. Ridiculous huh? On the other side, you may want to know why Apple is choosing this place to open its next China flagship store. Parkland Mall is actually one of the largest shopping centers in Dalian; and it is a must-visit shopping center if you are a fan of popular brands. On the first floor of the Parkland Mall, where the Apple flagship store will be located, there are stores such as Starbucks, Emporio Armani and Burberry. And where is Dalian actually? What’s so special about this city? Well, Dalian is a touristic city, very appreciated by Chinese people, especially for its non-polluted environment, the beaches, seafood and comfortable weather. It is the second largest city of Liaoning Province, and it’s really near to Beijing. Traveling to Dalian from Beijing only takes you 30 minutes, by airplane. Train could take about 5-6 hours. How about flying from Shanghai to Dalian? The flight time will be 2 hours. But for people who are staying in Southern China, for example, Shenzhen, the flight time will be at least 3 hours to get to Dalian.